As the world’s most populous with a population of 1.42 billion, China’s unprecedented economic growth, political influence and technological advances have transformed the country into a global powerhouse. Given the size of the market and its growing middle class, China’s influence is now impacting the global wellness industry. At the recent 2018 Global Wellness Summit that took place in Cesena, Italy, Cathy Feliciano-Chon (managing director of CatchOn & Company, a strategic marketing and communications consultancy specializing in travel, hospitality, wellness and lifestyle) gave a riveting presentation called “The Impact of China on Wellness… and Everything Else,” which helped usher in a great deal more interest and awareness of China’s role in the future of the global wellness economy. – The healthcare sector is expected to reach $1 trillion; and according to SpaChina, the beauty and wellness market in 2017 was worth $14.5 billion. While these figures only reflect part of the picture, they illustrate China’s seismic shift toward health and wellness and the opportunities for growth. Despite this trend, the market is fragmented with different notions of health, reflected in spending decisions and lifestyle choices, which also vary from the West. While local companies are gaining traction, international brands in the health and wellness category are still leading the industry. Brand-savvy Chinese consumers still value the stringent safety standards, improved quality and innovation that foreign brands promise, and they are willing to pay premium prices for them. At Ahn Luh Zhujiajiao, guests are invited to practice the ancient art of calligraphy in a lobby that has been repurposed from a beautifully-restored, 600-year-old courthouse dating back to the Ming Dynasty. Who is Driving the Wellness Boom? Many of these changes are driven by the explosive growth in China’s emerging middle class, which is on track to expand from the current 430 million to 780 million by 2025. Among them, the generation born after the 90s (comprising 16 percent of China’s population today) is considered the new engine of consumption. Powered by their extraordinary levels of wealth, exposure to western culture and digital fluency, they are expected to account for over 20 percent of total consumption growth in China by 2030. Sophisticated and well-educated with a global mindset, China’s middle class places a healthy lifestyle as a high priority and sees this as the definition of a good life. Over 70 percent exercise regularly, purchase organic food, and strive to achieve a daily work-life balance. This market segment also dominates global consumption for a variety of products, from American almonds to Korean beauty products, and their penchant for online shopping drives more than half of all global e-commerce. Although males outnumber females by 34 million, the “she-conomy” in China is growing, driven by an increase in income level, broader exposure, and changing roles and values. Eager to travel abroad and engage in healthy lifestyles, women are leading the wellness consumption trends in China. Aside from fueling the fitness craze and contributing to the double-digit growth in health supplements, women are overtaking men when it comes to independent travel. In 2019, 59 percent of outbound tourists are expected to be female (an increase of 18 percent), with 14 percent more in spending compared to their male counterparts. Whether girlfriend getaways, health travel or multigenerational holidays, Chinese women are driving the travel experience and will influence how tourism destinations, wellness and hospitality brands develop their offerings. China is facing a looming health crisis—an unsupported aging population as a result of the one-child policy, record-high pollution levels, growing obesity rates, heightened level of progressive and serious illnesses (for example, diabetes has an overall prevalence of 11 percent, while another 36 percent of the population has a pre-diagnosis), exploding cancer rates (three million new cancer diagnoses and 2.2 million cancer deaths each year, compared to 1.6 million and 600,000, respectively, in the US), and an ailing healthcare system. In response to the growing pressure, the State Council has launched the ambitious “Healthy China 2030” initiative to showcase its commitment to preventing disease and improving public health and fitness. The comprehensive 29-chapter document outlines a range of policies, from public healthcare infrastructure and environment management to medical industry reform and food and drug safety. The initiative has ambitious targets, from having 530 million people take part in physical exercise on a regular basis to extending China’s average life expectancy to 79 by 2030. These targets will drive an unprecedented surge in the healthcare and wellness economy. What is ahead for China? We identify seven market trends and observations that are shaping the wellness industry and will contribute to its long-term growth. Amanyangyun features one of the largest and most comprehensive spa and wellness centers in Shanghai, incorporating cutting-edge technology and innovative science with centuries-old holistic healing philosophies. China’s outbound travel will have the biggest impact on global wellness. Wanderlust among Chinese consumers will dominate and reshape global tourism with its explosive growth and unique consumption habits. In 2017, China Outbound Tourism Research Institute (COTRI) recorded 145 million international trips taken by the country’s 7 percent passport-holding population. Chinese travelers also took the lead as the world’s biggest spenders with an expenditure of $258 billion, followed by the United States at $135 billion. On average, each Chinese traveler spends more per trip than tourists from any other country. As the number of passport holders continues to rise, this number is expected to balloon to 200 million in less than two years. This represents an astounding 20-fold growth since 2000 while spending is predicted to increase to $429 billion. Adding to these phenomenal figures, the number of Chinese outbound tourists is expected to reach 400 million by 2030, representing 29 percent of the global travel market. Of particular interest to tourism boards is the changing motivation for travel. Increasingly, Chinese tourists are eschewing the long-established shopping and sightseeing tours and are now more focused on authentic experiences. According to a 2017 survey from Qyer, one of China’s leading travel powerhouses, over 70 percent of travelers are seeking local experiences or wellness-related activities, such as culinary exploration, outdoor recreation, gallery and museum visits, nature/ecological tours, beauty and spa treatments (women still prefer facials while men favor body massages), and hot springs. China has jumped from the 11th to the third position in wellness tourism, with 70.2 million wellness trips made in 2017, driving a global revenue of $31.7 billion. Since the quality of domestic medical care is a major concern, many Chinese look abroad for healthcare and medical treatments. With half a million outbound Chinese medical travelers spending at least $10 billion a year, the market in other countries is highly lucrative for hospitals, clinics and agents. The services range from checkups, prescription fillings, surgical procedures, maternity and plastic surgery. In response to China ending its one-child policy, there is also a wave of outbound travelers seeking fertility treatments. Over-the-counter medicine and health supplements are also high in demand. While the middle class prefers regional destinations, such as South Korea, Hong Kong, Japan, Taiwan, Thailand and Singapore, the ultra-rich prefer France, Germany, Switzerland, the United States and the United Kingdom for more advanced treatments, drugs and technologies that are not available in the Asia-Pacific region. These include stem-cell treatments, advanced cancer and cardiac treatments, in vitro fertilization and wellness programs. There is also a growing trend for consumers to fly by private jets to receive treatments. While most of these charters are from high net-worth individuals in Beijing, Shanghai, Shenzhen and Guangzhou, there are increasing private flights from second-tier cities such as Dalian, Chengdu and Chongqing where the numbers of ultra-rich individuals are growing. On the other hand, Global Growth Markets estimates that there will be 900,000 outbound medical tourists from China by 2020, looking for minor treatments such as cosmetic surgery and health checks, along with 100,000 patients traveling for advanced treatments, such as cardiology, oncology and neurology programs, fertility treatment, obstetrics, gynecology and joint replacement. For inbound travel, China is expected to outrank France as the world’s most popular travel destination by 2030. The increase in the number of international visitors to China should be considered in light of the country’s unstoppable domestic tourism. In 2017, domestic travel accounted for over $720 billion and 5 billion trips. With tourism becoming a new driving force in China’s economy, much investment has been made to develop the country’s infrastructure, from speed trains to airports, and to introduce tourism-friendly policies and initiatives. Not only do these improvements inspire more Chinese travelers to consider local vacations, but they also create new business opportunities targeting domestic travelers on short getaways. Alila, Aman, Banyan Tree and Six Senses are pioneers in the wellness market in China, with each new property setting a higher benchmark for the wellness hospitality industry. The recently-opened Amanyangyun (Yang Yun means “nourishing cloud”) features one of the largest and most comprehensive spa and wellness centers in Shanghai, incorporating cutting-edge technology and innovative science with centuries-old holistic healing philosophies. Positioned as a sanctuary for holistic wellbeing and restoration, the 2,840-square-meter facility covers every aspect of wellness, from beauty, nutrition and movement to emotional and spiritual wellbeing. West of Shanghai in Suzhou (a UNESCO world heritage site), Sangha Retreat by Octave is a nourishing health and wellness destination, providing an immersive experience in nature, healing and harmony. The 46-acre lakeside retreat is the vision of Frederick Tsao, a fourth-generation leader of a Singapore-based family business, himself a graduate of the University of Michigan. Sangha takes a global view toward transformative, holistic wellbeing, blending Western science with traditional Chinese philosophy. It begins with a comprehensive medical assessment by an international team of doctors who create a customized program of nutritionally balanced meals, healing treatments, exercise and activities, plus follow-up support for lasting lifestyle changes. These examples illustrate the options currently available for the increasingly discerning wellness traveler in China. As the concept of wellness evolves and is now recognized as a way of living rather than a trend, it continues to shape the way people travel. Worth noting is the growing influence of traditional Chinese medicine in tourism, which is expected to steer an increasing number of foreigners to the clinics in China, starting with the visa-free Hainan Island as an emerging global wellness tourism hotspot, which has been visited by over 800,000 tourists from Russia and Central Asia since 2010. In addition to over 4,000 traditional Chinese medicine hospitals, 43,000 clinics and 425,000 practitioners across the country, the government has plans to build another 15 “model zones” similar to the one in Hainan by 2020. Sangha Retreat by Octave is a Suzhou-based retreat and integrated wellness community for mindful living. Despite the rapid economic growth, China’s extreme work culture and fledgling corporate wellness sector have resulted in increased stress levels and anxiety while more embark on a spiritual quest to question their purpose in life. More Chinese now take a keen interest in reckoning with their authentic roots, prompting a growing demand for traditional arts, cultural practices and philosophy in a bid to relieve stress and achieve emotional wellness. International hospitality brands are among the first to respond to this growing trend. Just an hour from Shanghai at Ahn Luh Zhujiajiao, guests are invited to practice the ancient art of calligraphy, a form of meditation in the Buddhist culture, in a lobby that has been repurposed from a beautifully-restored, 600-year-old courthouse dating back to the Ming Dynasty. 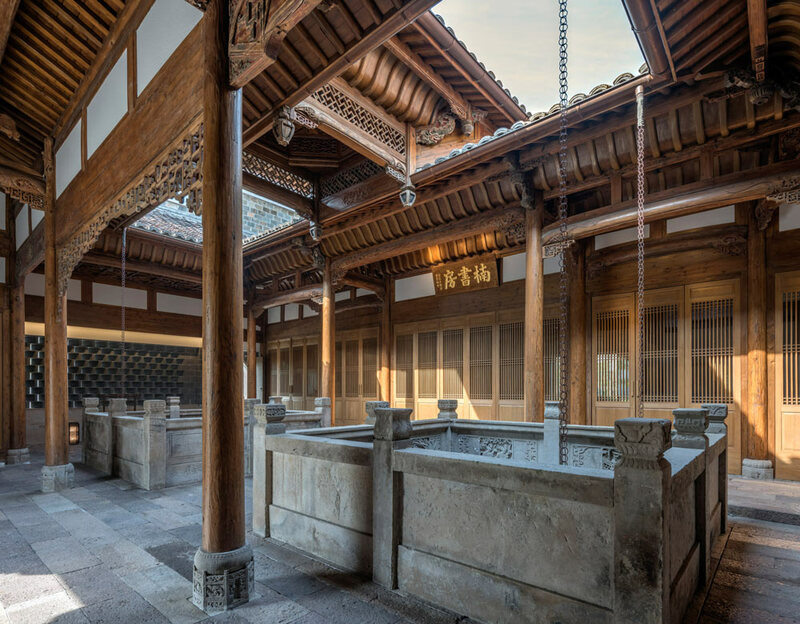 In Amanyangyun, the imposing reading pavilion Nanshufang is a dedicated space to learn, contemplate and practice traditional crafts, such as music and painting, or watch Kunqu opera. Local brands are also taking advantage of this trend. Tsingpu Retreats (meaning “back to the root” in Sanskrit) operates small-scale luxury boutique lodges in some of China’s most charming, culture-rich and largely unknown locations. Each resort’s design reflects a strong sense of place while the authentic guest experiences emphasize local cultural activities, from lacquerware making and traditional fan-making to bonsai gardening, zither playing and meditation. Beyond the current portfolio of seven resorts, the group plans to expand to over 90 locations within the next five years. Temple getaways have been attracting an increasing number of pilgrims, who seek a short stay to cleanse their mind, body and soul through eating vegetarian food, practicing Zen meditation and engaging in a philosophical exchange with spiritual gurus, be it Buddhism, Confucianism or Taoism. Teahouses are also targeted for a modern makeover. A concept since the Tang Dynasty, teahouses are viewed as places to contemplate, exchange ideas, and promote civility. Zen-like meditative teahouses are dotted throughout the urban landscape to exemplify scholarly living in the 21st-century style. Li Garden in Shanghai is discreetly nestled behind two office buildings to offer an otherworldly place of tranquility. Bookstores also now function as microcultural spaces to bring people together in an atmosphere of learning. Design-savvy outlets such as Fangsuo Communes and Zhongshuge are part-bookstore, library, café, lifestyle retail hub and creative meeting point, drawing culture vultures in droves. Trainyard Gym is designed as a vibrant social hub “to connect, work out, push limits, and break boundaries together,” with weekly evening parties featuring live DJs and specialty drinks to build a community. The pursuit of physical fitness aligns perfectly with China’s cultural ideals. While improving oneself level by level is valued, it is also important to receive validation from your peers. The made-in-China #A4waist and #iPhone6knee challenges that once swept across social media are classic examples. While Chinese have moved on from these bizarre fitness standards, peer approval still serves as a motivating factor for the 15 million gym-going consumers and influences every sector, from the design of gyms to the functionality of mobile applications. 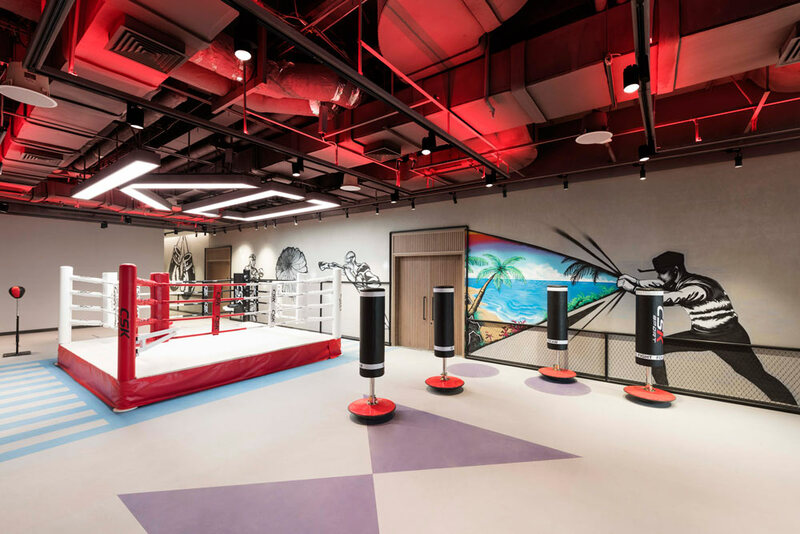 Beijing’s 3,500-square-meter Trainyard Gym is designed as a vibrant social hub “to connect, work out, push limits, and break boundaries together,” with weekly evening parties featuring live DJs and specialty drinks to build a community. The statement-making, graffiti-inspired, ultra-modern interiors and full-length city views also strike the right note with selfie-obsessed gym-goers who share their lives on social media. Even those without a full gym membership can connect to a local community online since there are over 1,000 community-based fitness mobile applications available. Keep, Yodo Run and Codoon are the most popular, with each amassing an enormous database of no less than 80 million users. Mobile fitness applications do not only measure personal performance and health data, but they also keep like-minded people united by providing an interactive, social platform where users share goals, pictures, experiences and triumphs. This community extends to events and local races. JoyRun hosted a record-breaking online marathon in 2016, mobilizing 450,000 participants across China to complete the race wherever they were, upload running times to compete with other fellow runners, and win a virtual medal. The increase in sports participation highlights the importance placed on a healthy lifestyle. In response to consumer demand, disrupter brands are making physical exercise more accessible, affordable and customizable. Local brand Supermonkey, for example, offers 24/7, pay-as-you-go access to their 50-square-meter, cube-like gyms in multiple central locations. Offering minimal facilities at low cost (starting from $7 per class) and operated through a mobile operation, the brand plans to open 200 outlets by 2020. Obviously, China is in the grip of a government-backed sports and exercise boom. While the older generation still prefers traditional martial arts, such as tai chi and qigong, the younger generation is keen on a variety of different fitness activities, ranging from dance (from hip-hop to Zumba), spin, yoga, Pilates and boxing. It is estimated that the sports industry is likely to top $436 billion by 2020. China will have the highest number of soccer playing fields and world-class golf courses as well as four million students in the Jr. NBA program. The country is also aggressively preparing for the Winter Olympics 2022 to position Beijing as the world’s sporting capital (Beijing is the first city to ever host both summer and winter Olympics). Vegetarianism is traditionally associated with Buddhism and Taoism. Conveying respect for all lifeforms, vegetarianism is rooted in the dharmic concept of ahimsa (not to injure and instead to express compassion). While many believers observe a vegetarian diet to mark celebrations, very few are committed to a vegetarian diet full time since the food is regarded as simple, bland and unimaginative. But this perception is changing. Thanks to the efforts of enthusiastic chefs to modernize and promote the once modest cuisine, coupled with growing consumer interest in the health benefits of a clean diet, Chinese spiritual cuisine is being reconsidered. Celebrated for its refined, creative and poetic characteristics, the cuisine is attracting a huge following among nonvegetarians. 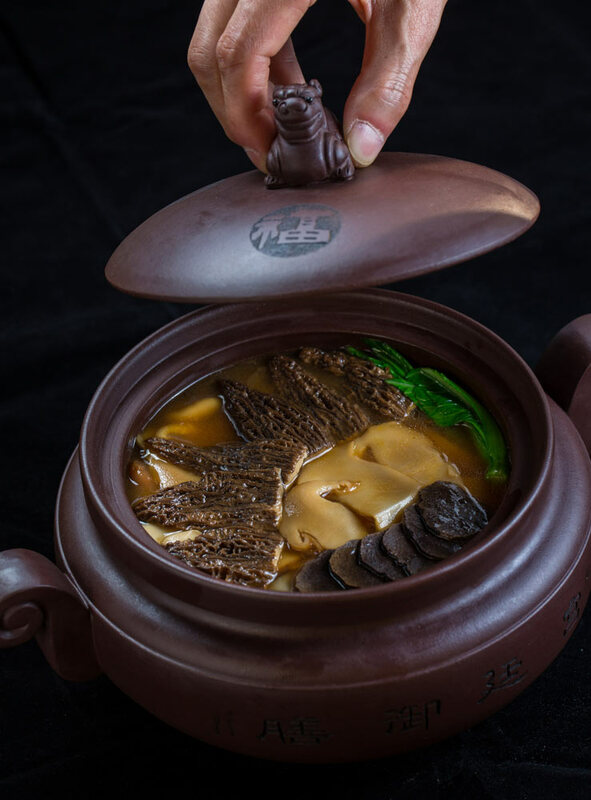 Shanghai-based restaurants Dashu Wujie and Fu He Hui (meaning “blessing, harmony and wisdom” and rooted in Buddhism philosophy) have been awarded Michelin stars. The latter has also been included in the coveted list of Asia’s 50 Best Restaurants for five consecutive years. King’s Joy is located in Beijing’s old cultural district opposite the Lama Temple. With a design resembling a tranquil mountaintop monastery, the restaurant is refined, stylish and spiritual. The restaurant is helmed by Chef Jianjun Pan, a former disciple at the Buddhist Donglin monastery in the Jiangxi province. Encouraged by his master to promote vegetarianism to the outside world, the meat-free menu features seasonal organic produce, and all dishes follow the “five colors, five flavors and five elements” principles inspired by Buddhist beliefs. Six Senses Qing Cheng Mountain serves an extensive menu that follows Taoism’s principles of establishing a yin-yang balance to promote health and longevity. Inspired by its sacred location, the birthplace of the Taoism over 2,300 years ago, the property features seasonal, local organic produce that has been a staple for Taoist monks for hundreds of years. The 50 nourishing dishes on the menu present the essence of the spiritual cuisine with artistic flair. Six Senses Qing Cheng Mountain serves an extensive menu that follows Taoism’s principles of establishing a yin-yang balance to promote health and longevity. In burgeoning Chinese cities where overpopulation, endless construction, traffic congestion and pollution are the norms, there is an emphasis on wellness design and architecture to reduce the impact of these urban problems. Local and international urban planners, developers and architects are collaborating to create sustainable, environmentally-friendly designs that complement the built and living environments. In China, Italian architect Stefano Boeri is taking the lead. He recently unveiled the revolutionary masterplan for the 175-hectare Liuzhou Forest City in the mountainous area of Guangxi. The development features high-density housing and office skyscrapers with smog-consuming facades covered by nearly 40,000 trees and one million plants of 100 different species. A first of its kind in the world, the innovative urban settlement is expected to depollute the surrounding environment by filtering 57 metric tons of dust particles from the air and absorbing 10,000 metric tons of carbon dioxide each year, while producing 900 tonnes of oxygen. It also reduces temperatures, provides barriers to reduce traffic noise, and regenerates local biodiversity. The concept is reportedly being developed for China’s other fast-developing cities, including Shijiazhuang, Guizhou, Shanghai and Chongqing. While the younger generation of Chinese consumers is increasingly adopting beauty and wellness practices from the West, their views and attitudes toward health are still fundamentally different. Traditional Chinese medicine has always been much integrated into the lifestyle of Chinese people of all ages. From dietary principles and herbal medicine to therapeutic treatments and martial arts, there is deep respect and appreciation for the time-honored philosophy to promote health and cultivate healing energy by maintaining and restoring a harmonious balance of the mind and body. This explains why in a culture where paper-thin is a benchmark of beauty, the fat-burning, high-intensity exercise regimes and the long-advocated high-protein-low-carb diets in the West were not seen to take China by storm. Instead, Chinese wellness enthusiasts lose weight through massages, herbal medicine and diet therapy to detox and promote circulation. In the same token, cosmeceuticals enjoy a market share of 50–60 percent in Europe, the US and Japan, compared to about 20 percent in China, where natural beauty products and high-touch treatments are still mainstream. While spa-goers in the West like steam, sauna and Jacuzzi, the centuries-old tradition of bathing in thermal water is the most favorite heat and hydrotherapy in China. It has been back in fashion since a decade ago and quickly become a fast-growing market, especially as the country is blessed with thousands of natural hot springs. According to China’s popular online travel agent Mafengwo, the revenue from hot springs travel has quadrupled since 2006 to have reached over $14 billion. While China’s reliance on imports and foreign expertise remains strong, the State Council’s “Made in China 2025” strategic plan expects to transform the country into an innovative, hi-tech powerhouse by 2025. China aims to replace imports with local products and promote homegrown brands, intellectual properties and technology. Ultimately, the goal is to inspire patriotic pride in the “Made in China” tag. To achieve this, the government is investing financial support, resources and market knowledge. The “Made in China 2025” strategic plan will dramatically alter the way brands and companies engage with China. In particular, biopharmaceuticals and advanced medical devices will be greatly impacted since they are among the 10 industries targeted as part of the ambitious plan. Nonetheless, China’s impact in the global wellness industry going forward is still immense, from the robust demand in beauty and anti-aging to the changes in the way people live, from the increased awareness in preventive medicine and public health to the shift toward healthy eating. The Global Wellness Economy Monitor has identified 10 key sectors where we expect to continue seeing China’s significant influence in the years to come. Since there is no standard statistical definition of “middle class,” the World Bank defines it as households with per capita incomes at purchasing power parity of $11-110 per person per day. Global Wellness Institute, Global Wellness Tourism Economy, (November 2018).